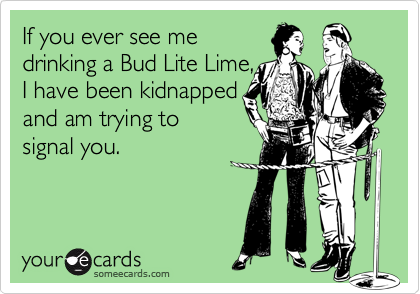 The famous Ed Roberts dared me to review Bud Light Lime Lime-A-Rita the other day. Heck, he even bought me the 24 ounce double-can. Basically, this is a pre-mixed margarita with some Bud Light Lime added to, I guess, spruce it up? Budweiser suggests on the can that you might try it over ice. I didn't. Per 12 ounces (keeping in mind this is a double can (so you'd multiply by 2 if drinking it all)): Calories, 330, Carbohydrates, 43.7g, Protein, <1g, Fat, 0.0g. Call the doctor! Diabetes in a can! You can also call them with Questions or Comments: 1-800-342-5283 (DIAL-BUD). Since I was so into the Bud Light Lime when I checked it out three years ago, this was a no-brainer to try. Decent carbonation. Lemony, pungent aroma. Super sweet flavors, sharp and sugary. Lemon and lime juice squeezed directly from the plastic things in the fridge, not fresh at all. In fact, this has a strange manufactured taste in the middle. Just muddled dirtiness. And not only is it really sweet, it's also salty. This "product" has nothing to do with beer. But it only faintly resembles a margarita too. Yes, it has the limey thing going on. OK. Duh. The 8% alcohol is completely hidden. Wonder how long it'll take before Lime-A-Rita drinkers figure out this is potent. "I only had one, Officer!" Luckily, the can does state "Contains Alcohol". Seriously, I wouldn't have known until the effects hit. Anyway, the finish is very drying, leaving a cotton-mouth like you've never had. Dump and pass. My theory is that Bud put this on the market to replace that despicable Rascal's Wild Red they pump out. You'll probably recall my prediction that Wild Red would be off the market by Labor Day, so that's still in play. So back to their tag line, "Margarita With a Twist". The only twist this margarita has is the one with the circulating toilet water. Good-bye! Oh, as I was doing this review, one of my friends sent me this Bud Light Lime card. Pretty funny. And one more. I am a serious lover of lemon-lime drinks. You guys have no idea how much 7UP and Sprite I drink, so for this "beverage" to be too much is pretty amazing! This gave me the worst heartburn EVER. TERRIBLE, HORRIBLE, NOT A BEER, NOT A MARGARITA. This is like a Sparks but worse. The key to drinking this is to find 23 friends to split it with. I actually really like these, and if I want a buzz I only need one, cost effective! But holy heck 660 calories is way too much for me to take in on empty calories, Im going to have to stop drinking these! There are a lot of issues with this but if the caloric content is what works for you, awesome! Haha. Rereading this from over 3 years ago made me LOL. Yess. I thought i was having a heart attack. I drunk one can . omg. All in my neck and shoulders!. I had to guzzle 3 bottles of water . along with pepto. To release the pressure. Wow!